One of the great racedays on the Australian racing calendar, packed with four Group 1s and every race on the card being black type. If this doesn't get you excited, better check you've still got a pulse! Once again, the professionals have been called in, the fellas from Premium Punting, @premiumpunting. Find out more about their work on their site. Our clients are already going into the race with three valuable tickets as advised to the public afterwards in our September 17 article. These runners are now the second, third & fourth favourites in the race, with all of them <50% of the price they were wagered upon then. As our profile shows there are four on-pace runners that need to find their positions. Of these, Lucky Tom has the potential to dig up and take the outright lead. The map also shows some particular problems for some runners. Our Vespa’s connections must decide whether they push onto lead or sit outside of it or restrain and be ridden upside down off midfield. Almalad’s position is also very dependent on what threats Shooting To Win & Looks Like The Cat do. If things go to plan he will be able to cross and sit just off the speed; but he may have to concede to settle midfield with a trial from one of them. Caulfield with the rail true does have the capability of playing advantageous towards the on speed runners, so early races must be monitored. -	10/19 winners had first attempt at 1600m. 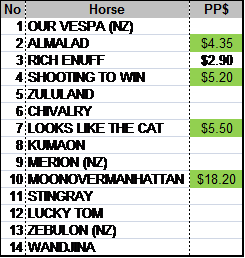 -	15/19 winners last start <1600m. -	15/22 drawn gate 4 or inside. -	4/22 won from double-digit gate. -	1/22 has finished further back than 4th at previous start. -	11/22 last start winners. Very impressive once again in the prelude, had to work a bit early to cross and sit in second and then bolted clear once in the straight for an easy win. Certainly a deserving favourite off three impressive time ratings. Although the mile will not be as beneficial for him when comparing to other runners, his ability to find his on-pace position and then relax is so beneficial when coming up to this trip fourth up. Like majority of other is expected to advance again and can understand his current public price. It is simply difficult to get him down lower to a 100% market. Messy race with a massive mid race squeeze but was too good for them third up in Stutt Stakes when extremely well backed. Very talented gelding as second up last campaign winning the high rating G1 JJ Atkins. Map is an little issue. Tommy will need to be astute early as he is very dependent on what others drawn inside of him do. More than capable of advancing again and if finds cover, even if it’s three wide, he is capable of advancing and producing a winning rating at a backable price currently. Won well in Stan Fox, raced clear showing good sprint on the good track. Does have a capability of dwelling at the start and struggling to muster early which means he could find himself if he does it badly settle towards the back of the field like he did in the Golden Rose when he settle 7L off the pace. Gets good rider bonus with McDonald riding and him drawing inside Looks Like The Cat & Almalad is a significant advantage as he will exert less energy in the early and middle stages. Is capable of ‘bouncing’ as high off his last start rating as the other major chances but can still improve enough to win. Also a current overlay. Rated down second up when running home well behind Rich Enuff. Did the same thing 1st up in a higher rated affair due to its Group 2 status. Third up last preparation fired when running very well behind Almalad in G1 level. Can he turn the tables on the favourite? He will not only require a much superior ‘spike’ to Rich Enuff but will likely also need the favourite to struggle in the last section of the 1600m trip, where he will flourish. Looks to have found about his right price and is a small overlay in some public markets. Advanced just below 2L when running an unlucky second in Stutt Stakes. If Newitt did not hand up the lead early then he wouldn’t have been blocked at 500m and then shuffled back badly in home turn. Maps ok rolling forward, hopefully this time holding his position outside of Lucky Tom. SP profile doesn’t read well but outside of his unlucky first up run he has had no reason to have a profile. Again has come up a big price where he is capable of advancing again and running a top three finish. $7.00+ can be found at some places. As stated above, monitor the pattern of the day. We should get a good handle on it by 5.40PM. IF PLAYS FAIRLY: Back overlay ALMALAD, SHOOTING TO WIN & LOOKS LIKE THE CAT again. IF PLAYS ON-PACE ADVANTAGE: Don’t wager against the favourite. Either way, do have a place ticket on MOVEOVERMANHATTAN.